We are delighted to announce our new Savwinch Bowsprits. We have designed a new Bowsprit that is Used to hold your anchor into position with the arch over the top, to prevent the anchor falling out. Made out of 316 Marine grade stainless steel with different designs available to suit most anchors. Savwinch have unique designs including one cast Stainless steel models to choose from. Advantages are one piece 316 stainless cast no weld points, stainless 316 rollers that will not wear. 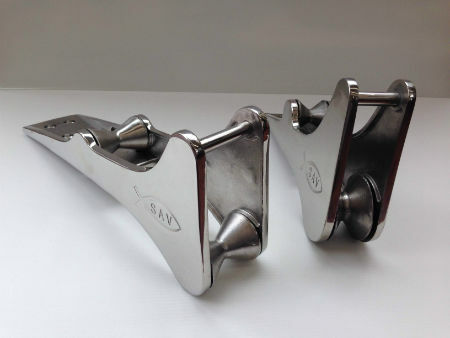 Enough fall between the two stainless rollers for anchor to freely drop that does not require any swivel action. Designed with extra heavy duty to withstand hitting structures or side loads when caught on reefs. Our new product has been tested for durability and precision. Contact us today for further information.